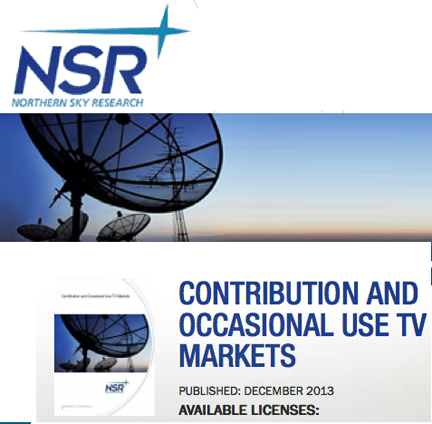 [SatNews] NSR's Contribution and Occasional Use TV Markets report quantifies the market opportunity for satellite-based contribution and OU TV services—in this new report, NSR focuses on the dynamics surrounding full time video contribution and Occasional Use (or Satellite Newsgathering) applications. From the migration to digital transmissions, to the impact of terrestrial on both contribution and OU/SNG, the market will demand over 700 transponders of FSS capacity and 1.4 Gbps of GEO-HTS capacity by 2022. Combined with over 3,400 full-time contribution feeds by 2022, and over 9.3 Million OU hours from 2012 – 2022, the market remains strong. Contribution feeds will benefit from new satellite bandwidth such as GEO-HTS and FSS Widebeam Ka-band to help expand the market. Contribution feeds will increase by over 1,000; yet through better encoding efficiencies the net result is less bandwidth utilization. Combined with changing prices for traditional FSS and emerging GEO-HTS, yearly bandwidth revenue change from 2012 to 2022 is minimal. Occasional Use markets will see hourly declines as access to terrestrial technologies expands. Driven largely by the even-year special events (Olympics, World Cup, Elections), occasional use traffic will begin to show signs of smoothing out as more of these live events are covered through terrestrial means. With over 4,000 In-service units by 2022, FSS Widebeam Ka-band and GEO-HTS will help drive growth within the OU/SNG markets. In short, terrestrial is the greatest restraint in the Contribution and Occasional Use markets. However, new satellite bandwidth, better compression technologies, and a steady hunger for higher-quality content from end-users will help provide for a stable market looking forward. NSR’s Contribution & Occasional Use TV Markets provides a data-driven analysis that quantifies the market opportunity for satellite-based contribution and OUTV services. Aimed at providing insights and analysis to satellite operators, service providers, and equipment manufacturers, the report offers a ten-year forecast for the market in terms of feeds, hours, equipment, revenues, and satellite capacity. With quantitative coverage and qualitative discussion, the reader is provided a clear-cut picture of how the Contribution and Occasional Use TV markets are developing today, and where they are heading.